A Scott house (or two). Episode: 65. Site Numbers: 001, 181, 311, 366. Date Posted: 23 August 1998. Update 17 March 2000. Location: London, UK. Type: Places. As a naval officer Robert Scott was more often at sea than ashore. Nonetheless he's known to have had a least three London addresses: 80 Royal Hospital Road SW3, 56 Oakley Street SW3 and 174 Buckingham Palace Road SW1. Scott's two sisters, Kitty and 'Monsie,' took rooms over a milliner's shop at 80 Royal Hospital Road (366), probably around 1896. His mother later moved there after her husband's death in 1897. And during the planning of the Discovery expedition Scott lodged here as well, each morning setting off by foot to the expedition's offices at 1 Savile Row. Upon his return from the Antarctic late in 1904 Scott moved the family to a rented house at 56 Oakley Street (001). These days the address might not be described as Chelsea's most desirable given the heavy traffic along the road, although the building itself--a four-story Victorian terrace--is handsome enough. It stands on the east side, three doors north of Cheyne Walk, where at No 133 Scott's future wife had a three-room flat. Unlike his next house, this one has the advantage of still standing (it's also the very first of the close to 400 'Low-Latitude' sites to be entered in my database). On the ground floor facade is a LCC Blue Plaque, unveiled on September 19, 1935, that reads: "Robert Falcon Scott Antarctic Explorer (1868-1912) Lived here." Notes at Scott Polar Research Institute suggest that Scott wrote at least part of The Voyage of the Discovery here (a claim also made for Markham's 21 Eccleston Square house--see Episode 63--and The Burlington at Sheringham on the Norfolk coast). Scott stayed here until 1908. Scott's third address is more interesting, in part because it was here, for less than two years, that he would make his home with Kathleen Bruce to whom he was married on the 2nd of September 1908. 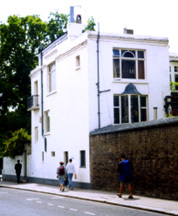 Two months before, they took a 27-year lease on a Georgian terrace at 174 Buckingham Palace Road (311), described by Diana Preston in A First Rate Tragedy as "...eight rooms with a garden studio for Kathleen to sculpt in ... for £50 a year." 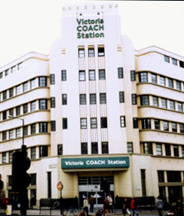 The house, along with the entire block from Elizabeth Street to Semley Place, was torn down in 1928 to make way for the Victoria Coach Station. In 1927, Kathleen--re-married to Edward Hilton Young, Lord Kennet--moved to Leinster Corner (181), the house once lived in by Sir James Barrie at 100 Bayswater Road. Kathleen converted the coachhouse at the rear, where Barrie had written Peter Pan, into her studio. According to the phone book and the nameplate on the door, Youngs still are in residence. [Barrie was a close friend of the Scott's; Kathleen was seated between the dramatist and Max Beerbohm at the luncheon where she first met her future husband; and one of Scott's last letters, written at the final camp, was to Barrie.] Those curious about Kathleen's interesting (to say the least) life, both before and after Scott, might wish to seek out granddaughter Louisa Young's A Great Task of Happiness; The Life of Kathleen Scott, published a few years ago.